One of the hottest topics in the election campaign has been the offshoring of jobs and whether to support the Trans-Pacific Partnership (TPP) trade agreement. The Reshoring Initiative’s 2015 Reshoring Data Report shows that rapid job loss has been stemmed, indicating that globalization has peaked. The emergence of localization and regionalization as a preferred business model is good news for the reshoring trend. Challenges still remain for the U.S. to bring back the three to four million manufacturing jobs still lost to offshore, but considering the progress already achieved, plus the more level playing field that will develop with Industry 4.0 and, hopefully, the new president, we predict that there is much more reshoring to come. From the manufacturing employment low of February 2010 through the second quarter of 2016 more than 265,000 manufacturing jobs have been brought from offshore, about 30 percent of the growth in manufacturing jobs in that period. The annual count was off 6 percent from 2014 due to recently stronger headwinds such as: a very strong dollar ; low oil prices and shipping rates; and most competitor countries having weaker economies than the U.S. Recently, FDI (Foreign Direct Investment) has been stronger than reshoring. Both trends are based on the logic of producing in the local market, generally known as localization. One reason FDI has a higher number of jobs is definitional. If a U.S. company, e.g. GM, expands production in the U.S., we consider it expansion due to market growth, and we do not count it as reshoring unless the jobs were specifically brought from offshore. However, we count all job increases by foreign companies (Toyota, for example). Also, foreign companies, especially the Japanese, appear to have a better understanding of the lean benefits of local sourcing. For the second year in a row the number of jobs returning to the U.S. equaled or slightly exceeded the number of jobs leaving. See Figure 1. By comparison, in 2000-2007 the United States lost, net, about 220,000 manufacturing jobs per year to offshoring. The steady decrease in the net number of jobs lost per year, from 220,000 to zero, is consistent with the Labor Department’s job statistics. Manufacturing employment as of December 31, 2015 is about 2.3 million higher than a regression curve from 1997, the beginning of the greatest offshoring surge, to 2009, the beginning of the reshoring surge, would forecast. Clearly we are offshoring less and reshoring more. 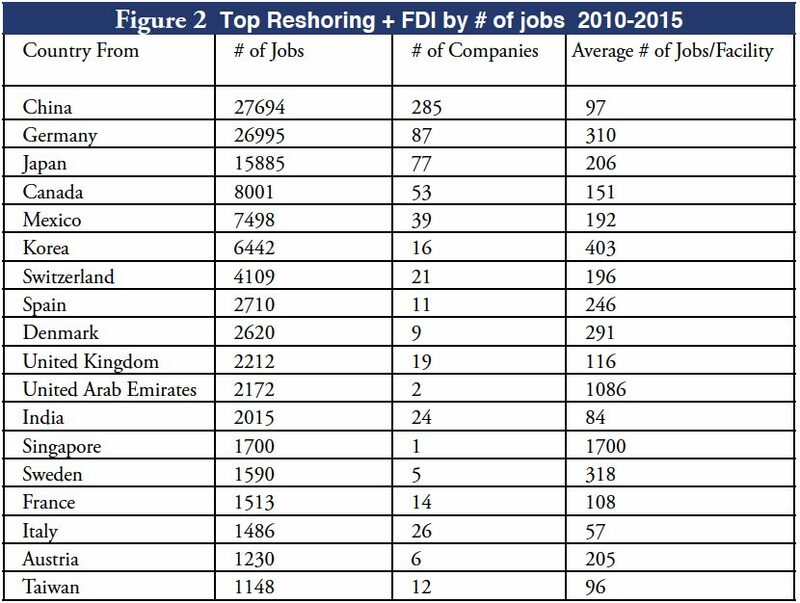 Of particular interest are the reasons companies give for reshoring and FDI. Government incentives, proximity to customers, and skilled workforce topped the list in 2015 for positive reasons to bring work here. At the same time, companies cited lower quality, supply interruption (this category had the largest increase from 2014, perhaps due to the west coast dock labor dispute), high freight costs and delivery as leading problems offshore. Cumulatively since 2010, rising offshore wages and total cost have been the major drivers of reshoring decisions. Structural tailwinds for reshoring include: ongoing wage increases in China and Vietnam; automation; and increasing consumer preference for Made in USA. Skilled workforce in the U.S. is improving, with credentials awarded by NIMS and MSSC rising 10 to 15 percent per year for the last decade. The top three regions from which jobs are coming to the U.S. are Asia (primarily reshoring), Western Europe (primarily FDI), and North America (Canada and Mexico). See Figure 2. Work moving from Asia to Mexico (near shoring) is another sourcing shift that is gaining strength, and is also a positive for U.S. manufacturers. Exports from Mexico have about 40 percent U.S. content vs. 5 percent for Chinese exports. The trend to shift jobs from offshore remained strongest in the Southeast and Texas, but in 2015 the West displaced the Midwest to hold second place. Cumulatively and in 2015, the strongest reshoring industry is Transportation Equipment, followed by Electrical Equipment and Appliances. Apparel is seeing the largest growth by percentage of company cases. About 60 percent of all reshoring cases are from China. Walmart is having the biggest corporate impact on reshoring, via their $250 billion commitment to supply more Made in USA products. The logic of reshoring and local sourcing applies to all countries, but countries that offshored more will have greater opportunities in reshoring. Other countries that are effectively focusing on reshoring include the UK, Canada, Netherlands, Australia, France, Italy, South Africa, Japan and Korea. Most of the reshoring in Europe is from Eastern Europe, which fills much of the role that Mexico and China do for the U.S. China has actually begun offshoring more work, but it is also focused on protecting and supplying its home market. Having brought back 100,000’s of manufacturing jobs despite the existing headwinds demonstrates that it is feasible for the U.S. to bring back millions more if the playing field were leveled. Leveling the playing field would require reducing some or all of these barriers: dollar consistently about 30 percent to 40 percent too high; currency manipulation by some countries; insufficient skilled workforce recruitment and training; highest corporate tax rate; no VAT (Value Added Tax); too many corporations buying on the basis of wage rates and ex-works price instead of total cost; and imbalances in the terms and enforcement of our trade agreements. Alternative energy sources, virtual and augmented reality communications, and sophisticated local food-production systems all will also support the localization trend. We need the government to overcome the barriers listed above. While we wait for our new president to resolve these issues, companies can focus on bringing back the 25 percent of offshore work that is reshore-able today. The most important tool to achieve this goal is total cost of ownership (TCO) analysis. TCO is defined as the total of all relevant costs associated with making or sourcing a product domestically or offshore. TCO quantifies and forecasts current period costs and best estimates of relevant future costs, risks and strategic impacts of local vs. offshore production, making it possible to evaluate whether reshoring or offshoring is the best choice. Retailers and distributors as well as OEMs and contract manufacturers can benefit from better understanding the cost factors of offshore products, and reevaluating their own domestic vs. offshore mix. In summary, reshoring can position your company to best serve your home market, both now and as markets continue to evolve towards greater localization. The winning national strategy is to balance the trade deficit via a national program of competitive currency and lower corporate taxes. Additionally, we need to see corporate commitment to new technology, skills training and increased use of total cost for sourcing and plant siting decisions. By eliminating our trade deficit, we will increase U.S. manufacturing by 25 percent, curtail unemployment and the budget deficit, improve income equality, strengthen our defense industry and motivate skilled workforce recruitment. Such an approach offers shared benefits for companies, employees, customers and the country. For full trend details, read: Reshoring Initiative Data Report: Reshoring and FDI Continue Strong in 2015. Click here for full report. Find free tools and data at www.reshorenow.org. 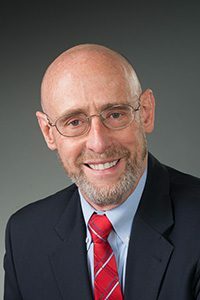 Harry founded the Reshoring Initiative to bring manufacturing jobs back to the U.S. after working for high end machine tool supplier GF AgieCharmilles, starting as President in 1985 and retiring at the end of 2010 as Chairman Emeritus. Largely due to the success of the Reshoring Initiative, Harry was inducted into the Industry Week Manufacturing Hall of Fame 2010 and was named Quality Magazine’s 2012 Quality Professional of the year. Harry participated actively in President Obama’s 1/11/12 Insourcing Forum at the White House, won The Economist debate on outsourcing and offshoring, and received the Manufacturing Leadership Council’s Industry Advocacy Award in 2014. Harry is frequently quoted in the Wall Street Journal, Forbes, New Yorker and USA Today and seen on Fox Business, MarketWatch and other national TV and radio programs. He received a BS in Mechanical Engineering and an MS in Engineering at MIT in 1967 and an MBA from the University of Chicago in 1981.